One of the girls in the office, Simran, loves the Hummingbird Bakery and always goes when she’s in London. Her favourite flavour cupcake/the one she always has is this one: red velvet with a cream cheese frosting. So I promised that I would, at some point, make some red velvet cupcakes to bring into the office. I eventually got round to making them last summer. And it’s taken me just as long to get round to blogging about them. 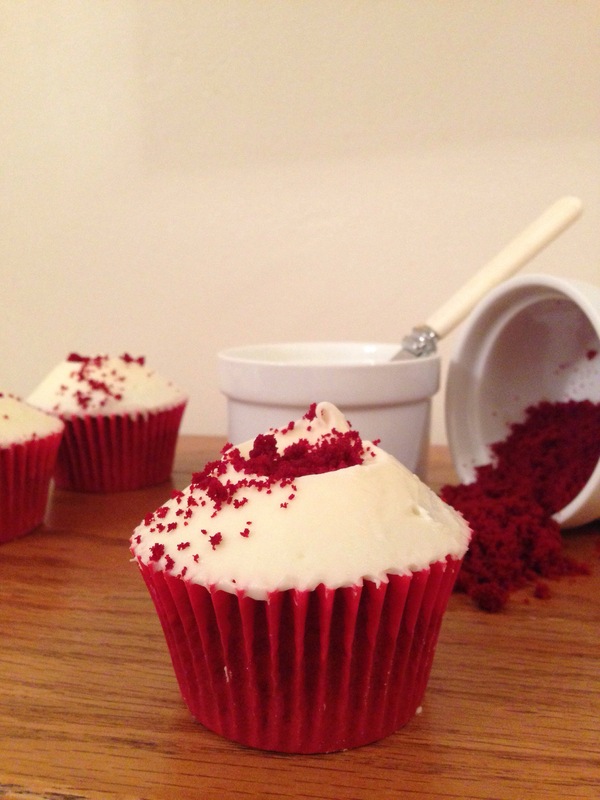 I’ve tried a few red velvet cupcakes in the past, but so far, the recipe from the Hummingbird Bakery is winning. The texture is light and fluffy, they have a hint of chocolate, and providing you use a completely artificial red food colouring they have a perfect red colour. 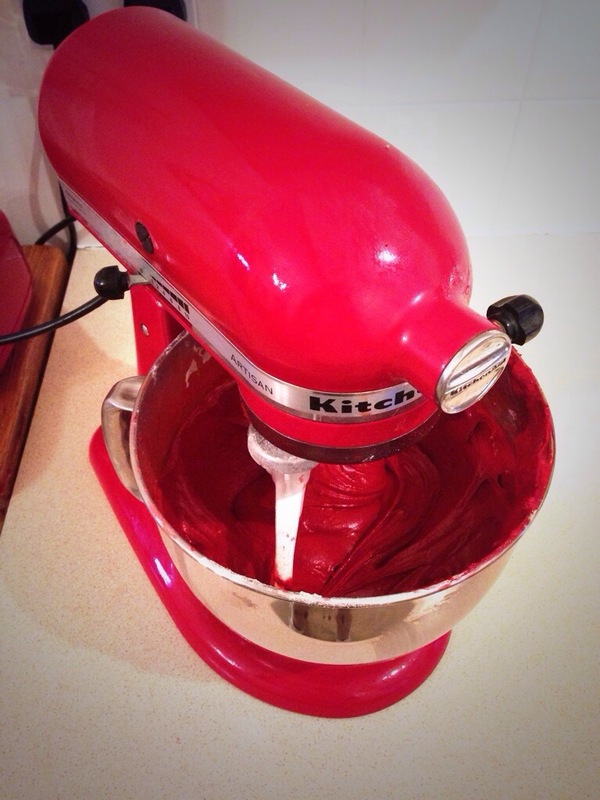 I used a whole tub of very red food colouring paste – seems like a lot but it works. You can tell if they’re going to be red by the colour of the mixture – if there’s a hint of brown (from the cocoa) then when they bake they’ll become even browner. The frosting is also really good: it’s light but creamy, and not too sickly sweet. In a couple of weeks time I’m going to be trying a couple of red velvet recipes, along with this one, as a taste testing for a friend’s wedding cake I’m making this summer. If it turns out that there’s a better recipe than this one then I’ll add it to the blog too. 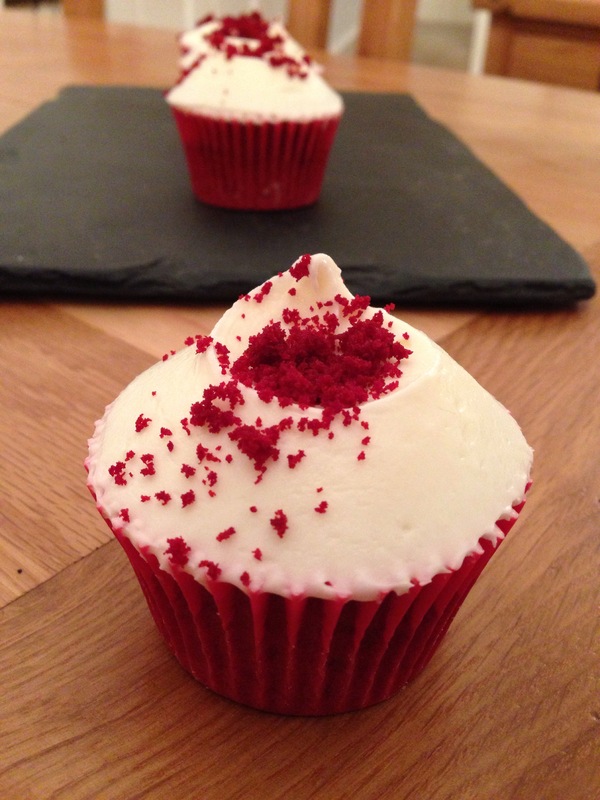 But for now, since it’s been a while since I posted a recipe here’s the Hummingbird Bakery one…. Line 2 muffin trays with 16 cases. Pre-heat the oven to gas mark 5 (190 C/375 F). Cream the butter and sugar together and then beat in the eggs one at a time, until fully combined. In a separate bowl mix the food colouring, vanilla and cocoa to form a paste. Add the paste to the butter, sugar and eggs. Sift in the flour and salt in 2 batches, alternating with the buttermilk – make sure you mix thoroughly after each addition. Mix the vinegar and bicarb together and then add to the cake mixture. Divide the mixture evenly between the 16 cases and then bake in the oven for 18-20 minutes until they spring back when pressed (and a skewer comes out clean). I usually check them and turn them around after 15 minutes. Take out the tins immediately and leave to cool on a wire ready. Decorate once completely cool with cream cheese frosting (see below). I sacrificed one cupcake and crumbled it up so that I could decorate the cakes with red crumbs. Alternatively you could use red sprinkles. Beat the icing sugar and butter together on a very slow speed until the mixture resembles coarse breadcrumbs and no lumps of butter remain. I always put a tea towel over the top of my KitchenAid to prevent icing sugar going everywhere! Then add the cream cheese and mix slowly until it is incorporated. Increase the speed and beat on medium until light and fluffy. Do not overbeat, otherwise you will end up with runny frosting.